It's that time of year again - time to think of original and creative uses for pumpkin, hehe. Good thing I love me some pumpkin anything (sweet, savoury - you name it!) and there are always new, bright 'n shiny ways to incorporate pumpkin into a mouth-watering recipe (I'm talking well beyond PSLs here). 50+ different ways, to be exact! That's right - it's a (virtual) PUMPKIN PARTY! Sara wrangled up several dozens of awesome bloggers (yours truly, included) to develop and share our favourite pumpkin-inspred recipes. I'm talking pumpkin-y twists on some amazing sweet treats as well as innovative, contemporary flavour-pairings using the ultra-fab, ever versatile squash. Autumn might not be long enough to get to all of these "must-try" recipes, so let's get straight to it! Of course, I was inspired to make cake. When am I ever not inspired to make cake? Never, is the answer. But since this is a PUMPKIN PARTY, I knew it could not be any ordinary pumpkin cake. I had this idea bouncing around in my head for months regarding pumpkin and chocolate stout cakes combined together. Regular pumpkin cake is a bit too expected (and it should be, because it is delicious), so I went the dark and dreary route for Halloween. Plus, I've seen Pumpkin Stout on the market, so I figured it was all worth a shot. 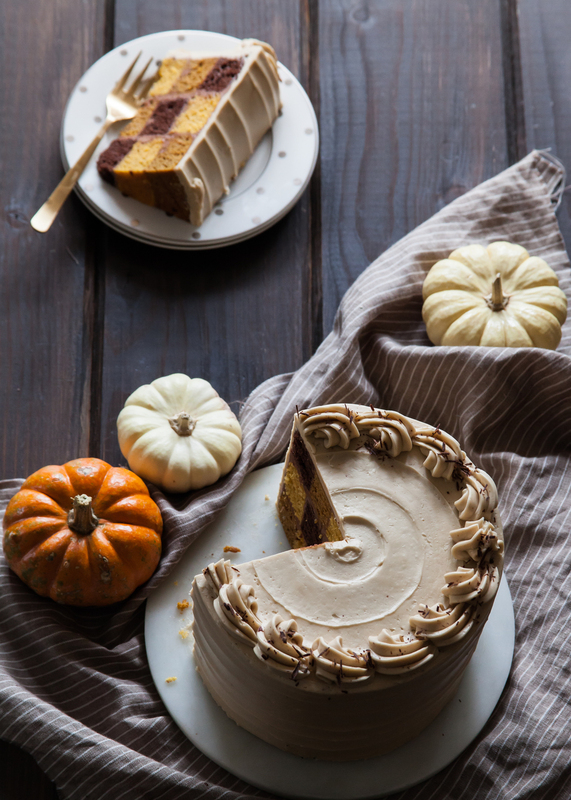 I have an incredible Brown Sugar Pumpkin Cake in my book (Layered), but I am afraid I won't be able to share it with you all until it is released (Spring 2016). So, off to the test kitchen I went! I began experimenting on two different ends of the pumpkin cake spectrum - ultra deep and flavorful vs. light and subtly spicy. I conducted a blind taste-test with my husband (seriously, I gave him cake scraps while his was in the dark putting the baby to bed, because we are an awesome team like that - hehe). He liked both. I liked both. So a double-pumpkin cake it shall be! 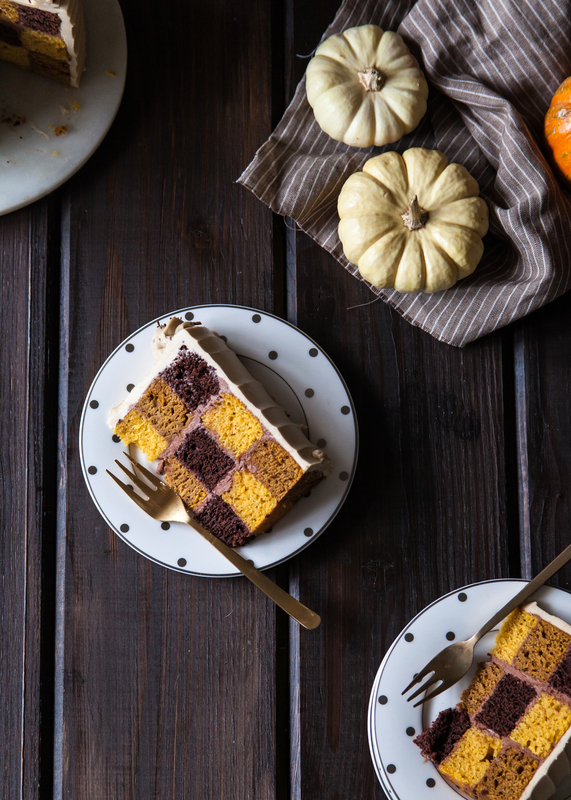 To incorporate all of the flavours, I put together a 3-color Chocolate Stout and Pumpkin Checkerboard Cake. How fun, right? The different flavours create this festive ombré of cake flavours. To bring out more of the stout flavor, I made a stout buttercream. Wha, what?? Yes! I actually don't like dark beer, but throw in some butter and sugar - and it's a party! It really is quite tasty. I reduced some of the leftover stout from making the cake and added in a bit of sugar. It reduced down to a deeply concentrate, slightly sweet stout. By itself, it is pretty off-putting, to say the least. But mixed with my go-to vanilla Swiss meringue buttercream, and it is dynamite! It's not nearly as booze-forward as other recipes, so definitely give it a try if you are on the fence about your sweets tasting too much like alcohol. Why is the buttercream a darker brown between the layers, you ask? I stirred in a bit of unsweetened cocoa powder. This version is also delicious, but the cocoa started to take away from the stout. I decided to use the cocoa stout buttercream between the layers because I thought it looked more atheistically pleasing against the darker cakes. Pre-heat over to 350 degrees. Prepare two 6-inch cake pans and set aside. Combine the beer and butter in a medium saucepan and heat over medium until the butter is melted. Meanwhile stir the sour cream and vanilla together. Whisk in the egg and set aside. Stir the cocoa powder and sugar into the butter/stout mixture until combined. Remove from the heat and stir in the sour cream mixture. In two batches, stir in the flour mixture. Evenly distribute the batter between the two pans and bake for about 22 to 25 minutes or until a toothpick inserted into the center of the cake comes out clean. Let completely cool before trimming and assembling. Pre-heat oven to 350 degrees. Grease and flour two 6-inch cake pans. Set aside. Using an electric mixer, cream together the softened butter and both sugars until light and fluffy. Add in the eggs, molasses, and vanilla. Mix until combined. In two batches, slowly mix in the dry ingredients. In a small saucepan, brown to butter by heating it over medium-high heat. The butter should melt and foam slightly. It is done when fragment and little bits of brown appear at the bottom of the pan (about 5 to 8 minutes). Remove from heat and place in a glass dish. Place in the refrigerator until cool. Stir together the cooled, browned butter and both sugars until light until combined. In a separate mixing bowl, whisk together the eggs. Add the beaten eggs to the sugar mixture and stir until combined. Place the egg whites and sugar in the bowl of an electric mixer. Whisk (by hand) to combine. Place the mixing bowl on top of the saucepan to create a double-boiler. Heat the egg mixture, whisking often, until 155 degrees on a candy thermometer or until hot to the touch. Once hot, carefully transfer the bowl back to the mixer. Beat on high with the whisk attachment until the egg mixture holds firm peaks (the outside of the bowl should return to room temperature). Stop the mixing and swap out the whisk for the paddle attachment. With the mixer on low, add in the vanilla and butter (a few tablespoons at a time). Turn the mixer up to medium-high. Mix until the buttercream if silky smooth. Add in the stout reduction and re-mix until combined. Simmer 1/2 cup stout beer with 3 tablespoons granulated sugar over low heat until it is reduced to 1/4 cup. Chill in a glass jar until ready to use. Assembly You might be thinking, "Hey Tessa, I have a total of 6 layers of cake - what the heck?" Okay, confession time. Yes, the entire recipe makes 2-layers of each flavour but you only need 3 layers to make one complete cake. Remember how I could not decide between the two pumpkin cakes? This is what happened... Now, you can choose to only make two of the cake recipes and turn this into a 2-tone, 4-layer checkerboard cake or have left-overs for a second cake (like me). I apologize for being misleading. To make the checkerboard pattern, you will need a 4-inch round cookie cutter and a 2-inch round cookie cutter. Basically, you will be cutting out rings of each cake, then re-assembling them with a swipe of buttercream in between to hold it all together. Be sure to alternate the different colors as you assemble. For more detailed instructions, check out my post here. If you'd like, stir in 2 teaspoons unsweetened cocoa powder to about 34/-1 cup stout buttercream to fill in between the layers of cake. Use the remaining stout buttercream to frosting cake and sprinkle with chocolate shavings, if desired. Cake Over Steak • Pumpkin Ginger Cookies with a Vanilla Glaze - Thank you, Sara, for putting this all together!